Google announced Material Design Support Library in their Google IO 2015. This month Google announced that there’s a new element to be added in Material Design components and it’s the Bottom Navigation. 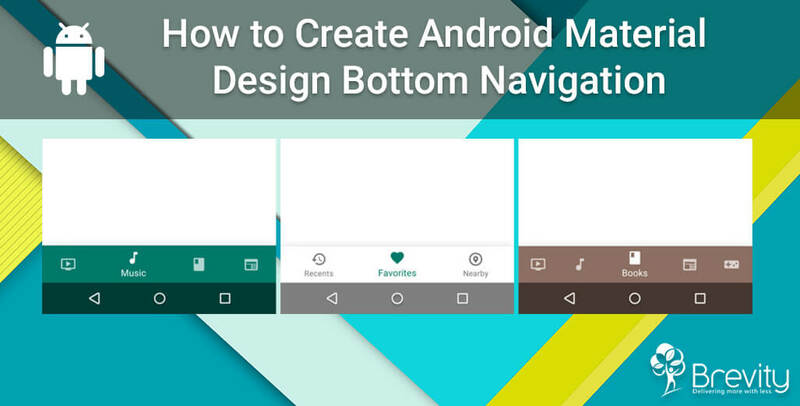 In this tutorial we’ll have a look on Android Material Design Bottom Navigation and how to implement it and understand its parameters and functions. Bottom navigation bars make it easy to walk through between top-level views in a single tap as it provides quick navigation between top-level views of an Android Application Development. And according to Google design guidelines, the bottom navigation should consist of three to five items. In this tutorial we will be building 2 Activities, one has three buttons and the other has four buttons on the bottom navigation bar. It consists of .XML file in menus and a java code to inflate this layout in your activity. 1. Creating Android Project, In Android Studio, create a new project by navigating to File ⇒ New Project and fill all the required details. When it prompts to select a default activity, select Empty Activity and lets name MainActivity. Great blog post! In my opinion, it’s a good idea to follow Google’s design guidelines for software development. But occasionally it can work against you. Anyway, looking forward to reading more great content!